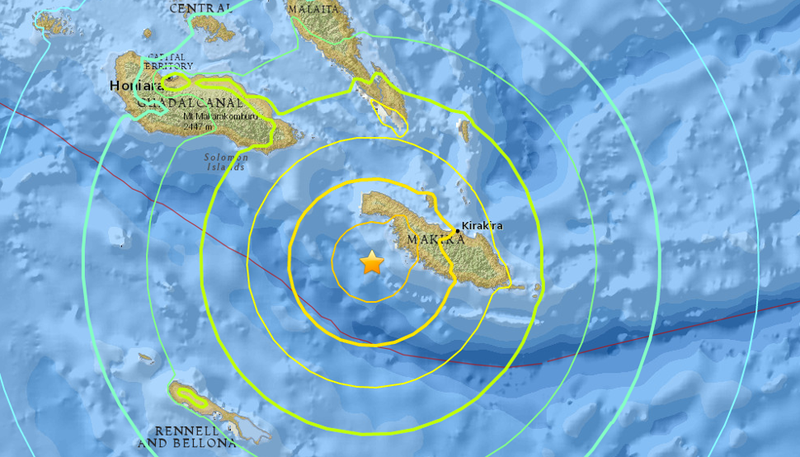 A magnitude 7.8 earthquake has rocked the Solomon Islands about 42 miles off the coast of Kirakira. A subsequent Tsunami watch was issued for Hawaii, but was canceled. Areas close to the quake are also on tsunami alerts. The quake happened early this morning at 7:38 am local time in Hawaii, and struck at a depth of 25 miles. No damage has been reported, but the large quake spawned tsunami warnings in the Solomons, Japan, and Hawaii. “Hazardous tsunami waves from this earthquake are possible within the next three hours along some coasts of Solomon Islands, Vanuatu, Papua New Guinea, Nauru, New Caledonia, Tuvalu and Kosrae,” declared the Pacific Tsunami Warning Center. Tsunami waves reaching three to nine feet (1-3 meters) are still possible along some coasts of the Solomon Islands, while waves reaching a few inches to three feet are possible for some coasts of Papua New Guinea and Vanuatu.